A U.S. president with Buffalo ties scandalized by claims of a child out of wedlock. A flying bat that's not the strangest moment in a Sabres game. A man who cooked an omelet on a tightrope high above Niagara Falls. A wandering deer that crashes into an Elmwood Avenue eatery, prancing around the bar. 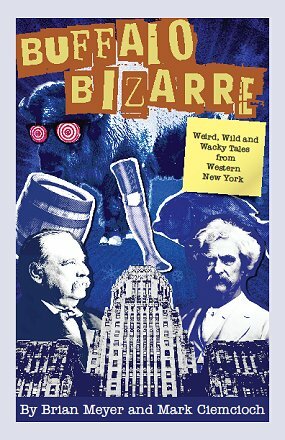 These are some of the strange and screwy stories scattered across Western New York's landscape that are highlighted in Buffalo Bizarre. From bullfights in Buffalo, local Bigfoot sightings and a sea serpent hoax that still sparks annual bashes, readers will discover hundreds of odd tales. There are unusual facts about milestones in Buffalo history, including the Blizzard of '77 and the Pan-American Exposition, along with offbeat nuggets about some less momentous events. Who remembers the Green Lightning flap or the overgrown lawn controversy in Kenmore that created international headlines? The real-life characters that fascinate us include a crooked Buffalo businessman who built the jail that he eventually landed in, and a TV weatherman whose mishap almost started an inferno during a live Halloween night report in someone's yard. There are even amusing anecdotes about Mark Twain's brief residency in the Queen City. If you think you know Buffalo, think again. After cruising down the boulevard of the bizarre, the region might never look quite the same.